The private sector is essential in bringing new technologies into the market. While publicly supported research provides a wellspring of new knowledge and discovery, it is the private sector that must identify, evaluate, and carry forward the best ideas to commercialization. Businesses, entrepreneurs and investors turn innovations into the products and companies that change the world. Mission Innovation (MI) assists members with identifying opportunities and engaging the private sector by exchanging information to improve understanding of clean energy innovation needs and perspectives, and by encouraging investment to expand and enhance the innovation pipeline. MI’s Business and Investor Engagement (BIE) Sub-Group acts as a focal point of member efforts to partner with the private sector and encourage greater public-private collaboration. For more information on MI’s efforts to connect with the business and investor communities, please contact secretariat@mission-innovation.net. 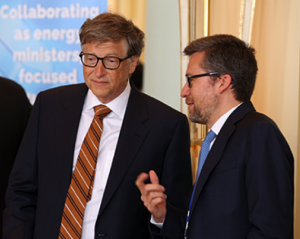 The Breakthrough Energy Coalition (BEC) was launched alongside MI at COP21. BEC is an international group of investors, companies, funds and banks committed to accelerating the commercialization of new reliable and affordable energy technologies that can help tackle climate change. BEC believes that forging deep partnerships between its members and governments will lead to more investments earlier, and more energy solutions for more people faster. Breakthrough Energy Ventures, the largest of the coalition’s investment vehicles, will invest US$1 billion in companies that need the unique attributes of the fund. In 2017, the Breakthrough Energy Coalition announced the piloting of public-private partnerships with five MI members. Stemming from this, Breakthrough Energy Europe a €100M investment fund, was launched in October 2018. By coupling sustained public investment in research and development with business leadership and insights, fledgling ideas can be more rapidly brought into the mainstream. MI has established a partnership with the World Economic Forum that facilitates greater engagement between leading businesses and MI members. This collaboration brings together business expertise and clean energy investment perspectives to provide a more comprehensive picture of the challenges and opportunities associated with the clean energy innovation system. As a result of this partnership, a joint MI – World Economic Forum workshop was held in September 2017 in Mexico City that focused on the first seven MI Innovation Challenges. 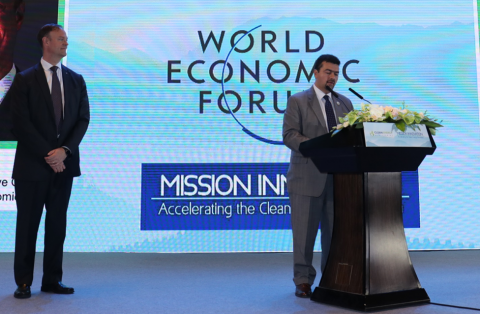 MI Ministers also participated in a special event on clean energy innovation at the World Economic Forum’s Annual Meeting in Davos, in January 2018, and the World Economic Forum’s Bold Ideas to accelerate sustainable energy innovation were discussed at the 3rd MI Ministerial in Malmö in May 2018. Leonardo Beltrán Rodríguez (right), Deputy Secretary of the Ministry of Energy of Mexico (SENER); and David Aikman (left), the World Economic Forum’s Chief Representative Officer for China, announce the collaboration between MI and the World Economic Forum. The 3rd MI Ministerial meeting in May 2018 included a session entitled “Public-Private Cooperation on Clean Energy Innovation: Deals for Decarbonisation”, which involved five breakout discussions focused on concrete means to accelerate action around specific technologies. A report summarizing the key outcomes and topics raised during the sessions is available. In March 2018, MI partnered with the Canadian Financing Forum to host an MI Clean Energy Financing Event. This successful event included pitch sessions and networking activities geared to help connect tech developers with potential investors. The BIE Sub-Group has mapped the investors, funds, corporations and other stakeholders that play a key role in financing clean energy innovation. This work, entitled Mapping the Clean Energy Innovation Investment Ecosystem helps MI members build relationships with businesses and investors so they can make more informed decisions on engagement opportunities with businesses and investors. The ecosystem map also helps to inform and enhance MI member decision-making in relation to the best use public funding for clean energy RD&D policies and programs.